Our frequently asked questions page answers the most common questions you might have about acupuncture. Most people have only a vague idea about what types of conditions acupuncture treats. You might be surprised at the extensive list of conditions successfully treated with just a few acupuncture needles! Read through the questions below and see if your question is answered here. If you still have questions, please call the office at (610) 357-4376. Or contact us. We will be happy to speak with you! Scientific research shows that acupuncture stimulates chemicals in the brain that stop pain, relieve stress, and reduce inflammation. Acupuncture even regulates hormones in conditions such as PMS, menopausal hot flashes, and irritability. Depression research has been conducted that demonstrates acupuncture is at least as effective as anti-depressants and reduces the side effects when used in conjunction with anti-depressant medication. Acupuncture stimulates the immune system to relieve asthma and allergies. Traditional acupuncture theory understands that human beings have an energy anatomy – similar to the blood vessels that make up your circulatory system. Your energy anatomy however, consists of meridians that flow through the body from head to feet like the acupuncture model in the photo above. 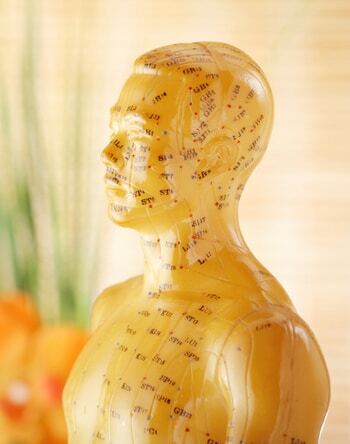 Acupuncture meridians are the pathways that carry your life force – also known as qi. Flow of qi through the meridians is responsible for all of the functions of the body, digestion, sleep, energy production, and movement just to name a few. Your meridians require a healthy, free flowing pathway in order for your body to function normally. When meridians become blocked due to diet, lifestyle, injury, or illness, body functions slow down. You may develop allergies, headaches, or acid reflux. Low back or neck pain may develop with no history of injury. Why is this? Pain occurs when meridians are blocked and qi cannot flow freely. Free flow of qi is required for the experience of pain free movement and full range of motion without stiffness. Acupuncture unblocks your qi, freeing the life force to move through you so it can nourish tissues, tendons, ligaments, and bones. Your organs receive vital life force so they can function properly, helping to cure illness. Acupuncture boosts your body’s ability to heal itself. It is said that acupuncture harmonizes the meridians so that your body acts as an integrated whole. Balance is achieved when all of your systems are communicating and cooperating with each other. The word ‘needle’ can provoke a lot of fear – even in some of the bravest people! Please don’t worry, acupuncture is usually not painful. In fact, most people describe the sensation as a light tap, followed by a heavy or full sensation that is not at all unpleasant. The heavy sensation people feel is called ‘de qi’ which means ‘the arrival of qi’. Qi is the energy inside you that acupuncturists use to move blockages that may be causing pain or illness. The sensation may come and go during a treatment – or you may notice wandering sensations in areas where no needles have been placed. You are feeling your qi as it circulates through the acupuncture meridians. It is a healthy response to acupuncture treatment. Please see our treatments page for a list of specific conditions. Each condition is linked to a page where you will find complete information on acupuncture for a specific pain or illness. There you will find patient testimonials, research, and useful information about your unique health concern. Please see our Acupuncture page under the Services tab for a complete description of an acupuncture treatment session at Inner Light Wellness. Most of my patients report noticeable changes within the first 5 visits. Pain relief is fastest, followed by allergy relief, digestive symptoms, headaches, and insomnia. Permanent relief from more chronic conditions such as allergies, reflux, and depression take a few more visits but even these respond favorably to acupuncture treatment. For recent symptoms, especially those involving pain, 5-10 acupuncture treatments usually provides complete relief. People with ongoing severe pain or other chronic conditions require a 6-8 week treatment protocol consisting of up to 10-15 treatments for best results. Allergy and digestive symptoms are chronic problems that most people have had for years. Significant symptom relief is most often found within the first 5 visits. A round of allergy treatment is usually 10-15 acupuncture treatments over a 6-8 week period. The majority of my patients with seasonal allergies who have received one round of treatment report that their symptoms have not returned. For those few people whose allergy symptoms do return, symptoms are much milder the following season. Another round of treatment – but this time requiring fewer treatments – usually relieves them for good! For other chronic conditions such as reflux, insomnia, or anxiety the same protocol applies but these conditions usually do not require a second round of treatment. Treatment frequency for most conditions is twice a week until symptoms are gone between visits. Once you are symptom free between visits, we lengthen the treatment interval to one week. When you are out of symptom between visits at the one week interval, we try two weeks, then one month. If you are symptom free for one month, you are discharged for that symptom. If it ever flares up again, come in right away and you will only need a few visits. The earlier you get treated, the less number of acupuncture treatments you will need. However, if you have been suffering for awhile with your symptoms, don’t fret, acupuncture can be very effective at relieving even the most stubborn issues! When you are ready to schedule your first appointment, use the New Patients button in the top menu. Here you will find information about prices, the office location and the intake process. We’ve done our best to make your entire healing experience as easy and quick as possible. A small percentage of people experience a temporary worsening of symptoms after their first or second acupuncture visit. My teacher – Dr. Tan, considers this a very good sign that your body’s energy (qi) is working to remove the blockages that are causing your symptoms. As the qi pushes against the blockage, you may notice a temporary flare up of your symptoms. We call this an ‘exacerbation’. People who experience exacerbations usually only experience them once or twice and they usually last 24 hours or less. Afterwards, patients tend to report a dramatic reduction in pain or symptom. Temporary flare ups are similar to receiving physical therapy where you may be sore the next day. As your body is working to heal there may be a temporary increase in inflammation to bring healing substances to the injury. The best way to avoid flare ups is to eat lightly, especially after your treatment. Foods such as clear soups, rice, and vegetables are helpful. Sticky, thick food such as bread, cheese, and ice cream may increase the likelihood of a flare up. In other words: The night of your first acupuncture is not the night to go home and eat a pizza! Sensible eating assures the best results with acupuncture.